Why does my dog jump and how can I stop him? We loved this article that Pet Bucket just sent out. We also love Pet Bucket. 🙂 Did you know that Pet Bucket is the best for less expensive medicine? We love them – and if you order through our link here – we also get a discount for our rescue dogs. Our team member (and the one behind our site design) Chelsea uses it all the time for her two dogs. She loves the service, their products, and the cost is so much better than your local vet or online solution (and did you know it’s the same medicine?! It’s not a knock off or a cheaper option – it’s the same!!). Check out more here. Okay, back to the article about how we can stop our dogs from jumping! It may be cute in a puppy, but when your full-grown dog jumps up to greet you, it can be a nuisance and dangerous for children and elderly friends. 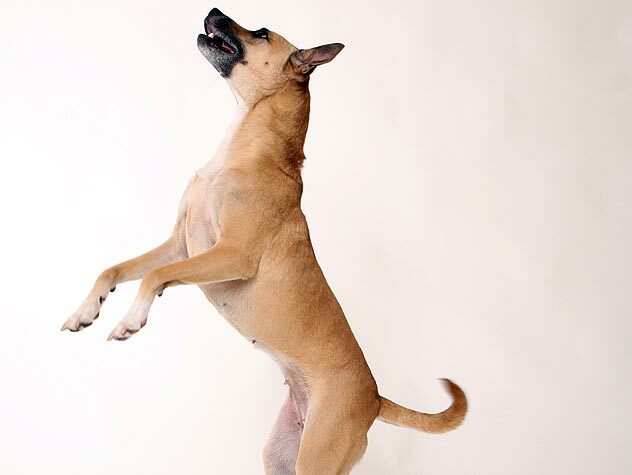 Because dogs jump up to say “hello,” it can be difficult to break them of the habit. With some consistent training, however, you can teach your pet a more polite way to welcome you and your guests. When puppies greet an older dog, they often lick the adult’s muzzle as an appeasement gesture. In the same way, your canine companion tries to meet you nose-to-nose, jumping on his hind legs to do so. To break your dog of his highflying habit, it is important to show him that you will only greet pets that have all four feet on the ground. If your dog jumps, don’t acknowledge him by pushing him off, but instead look over his head and turn away if necessary. As soon as your dog’s front paws are planted, reward him verbally and with affection or a treat, withdrawing your attention immediately if he hops on his hind legs again. Continue reading here. Author Nancy BownPosted on August 10, 2016 August 16, 2016 Categories Adopt, Prevention, Resources, Your new petTags behavior, discount, dog, dog harmony, jumping, medicine, pet bucket, pets, rescue, savings, stopLeave a comment on Why does my dog jump and how can I stop him?